It’s time to prepare for Christmas in the camp! For the last several years Australian Mercy has provided Christmas parties for all preschools in Mae-la camp. Over the years and as funds have been available we have been able to include other schools in the program. 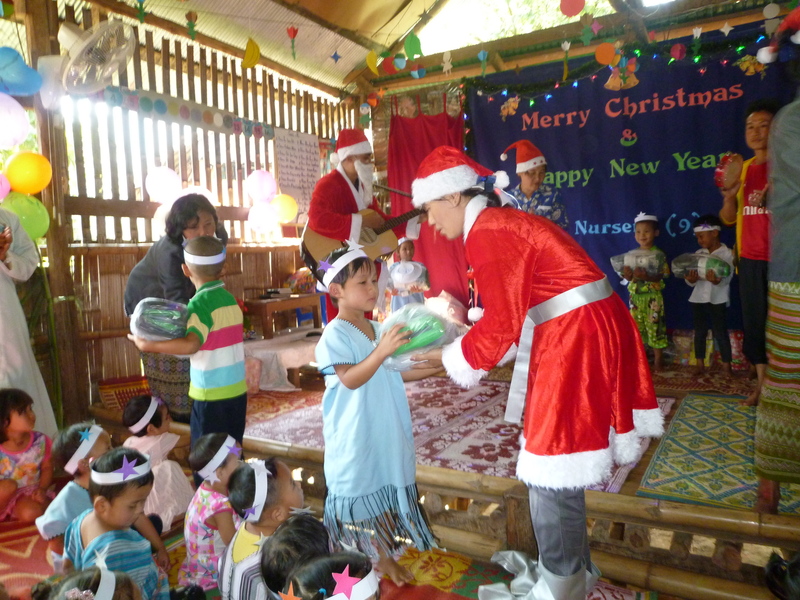 Christmas in the camp is highly anticipated by hundreds of families and for many is the hihglight of their year. Through the program all children receive a small Christmas present, have a Christmas party in their preschool or school, where songs are sung, games are played and the Christmas story is told. At the end of the celebrations a highly nutritious meal is served for all which usually consists of rice and chicken with vegetables and fruit. This program helps to bring hope and joy into the lives of these children and builds morale. The Christmas parties will be run in mid December but preparations need to be made now so that all can ready in time. Each preschool party is triggered by the arrival of Santa and his helpers. Once the Santa arrives the celebrations start and the fun begins. Last year more than 2000 children and 200 teachers in 22 preschools participated in Christmas in the camp, together with another 200 -300 primary school children, Our target for 2017 is 2500 children. The estimated cost for the program is $6,250 which is approx $2,50 per child. We need to have these funds in Thailand by mid October, your donation will bring joy into the lives of refugee families all throughout Mae-la camp.